I spent the last few weeks looking for a good shaving cream alternative. I tried several products and found that Dr Carver’s Easy Shave Butter was the best. I wanted to get a good shaving cream alternative because shaving cream always leaves my face super-dry. Even lotions wouldn’t help. Besides, I think that you shouldn’t have to put moisturizer on after shaving. Whatever you’re using should moisturize your face by itself. Plus, I tend to get razor burn pretty easily. I didn’t expect a product to fix everything, so I wanted to try different products to see which one was the best overall. Originally, I thought that the problem was just my shaving cream. Then I tried Gillette, Barbasol, etc. They all had the same result – not only would they dry my skin out more than the Sahara, they would clog my razor blades. Anyway, here’s my shave butter review. Shave butter has gotten really popular over the last few years, and for good reason. People make a big fuss over they use, but still use the same old foamy can. It’s not the 1940s anymore. When I was doing my research, I found that shaving cream (the type that comes in a can) is loaded with parabens that can lead to skin irritation. Parabens are used as preservatives in the cosmetic and pharmaceutical industries. They’re cheap and they help extend a product’s shelf life. But, since most parabens are rubbed onto the skin, problems can occur. Parabens can cause skin irritation, rash, contact dermatitis, eczema, and so on. Shaving butters tend to be made with more natural ingredients. They’re packed full of natural oils, which keeps your skin moisturized. Those oils also keep your razor from getting clogged, which not only extends your razor’s life, but helps prevent nicks and cuts. Gel, which gives it a lightweight texture and makes it easy to rinse. Cream, which gives it cushion, protection, and skin feel. Oil, which gives it lubricity. Because shave butter combines all these things, it makes it a better option than traditional gels and creams. Shave butter is surprisingly easy to use. It’s similar to shaving cream in the sense that you spread it across your skin and start shaving. I messed up at first because I used a little too much. You only have to use enough to create a thin layer. It’s not supposed to lather. From there, you just shave and rinse. To put this in perspective, a 6 ounce tube of shave butter should last a month or two if you shave 5-6 days a week. The most noticeable difference between Dr Carver’s Easy Shave Butter (the one I ended up choosing) and regular shaving cream is that Dr Carver’s Shave Butter is transparent, so you can see where you’re shaving. This would be a godsend if you wanted to line up your beard. I don’t have a beard, so it doesn’t really apply, but it’s still cool. When it comes to shave butter, I tried the two biggest players in the space. First, I tried Van Der Hagen Shave Butter. I was impressed with its great natural ingredients, including macadamia nut oil, cocoa, mango, and Shea butters. It’s definitely better than shave cream. I quickly realized that pretty much any shave butter would be better than shaving cream. Van Der Hagen shave butter felt similar to body lotion. It was too thin of a cream for me. It was also really drippy. It seemed like it had no lubrication, so it was like you were shaving with whatever, which gives me razor burn. Figuring that’s what I wanted to avoid in the first place, Van Der Hagen shave butter went straight in the trash. It did make my skin soft and moisturized, but it was awkward to use. 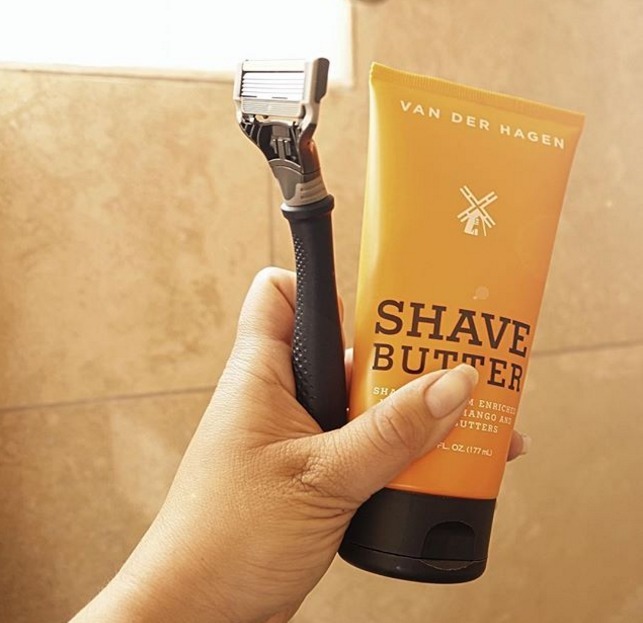 Van Der Hagen shave butter is definitely better than shaving cream, but it wasn’t nearly as good as…. After using the Van Der Hagen shave butter, I opened Dr Carver’s shave butter with my fingers crossed. I already discovered that shave butter was a fantastic shaving cream alternative, but Van Der Hagen didn’t seem lubricated enough. I read the ingredients of Dr Carver’s and saw that it had emollients (good for softening the skin) and anti-irritants. The only thing that worried me was that I saw it contained eucalyptus essential oils, which can cause skin irritation. I just remembered all the positive reviews I saw online (you can see the reviews here) and pressed on. I read online that Dr Carver’s shave butter is a gel-oil hybrid that rinses easily from your skin, yet moisturizes and provides an easy shave as a result. Not being one to believe everything I read online (which is why I did this test in the first place), I started to shave. I was rather impressed. This was way better than Van Der Hagen because it was a little thicker and didn’t drip at all. It stuck to the skin, and even though it’s thicker, it still didn’t clog up the razor. 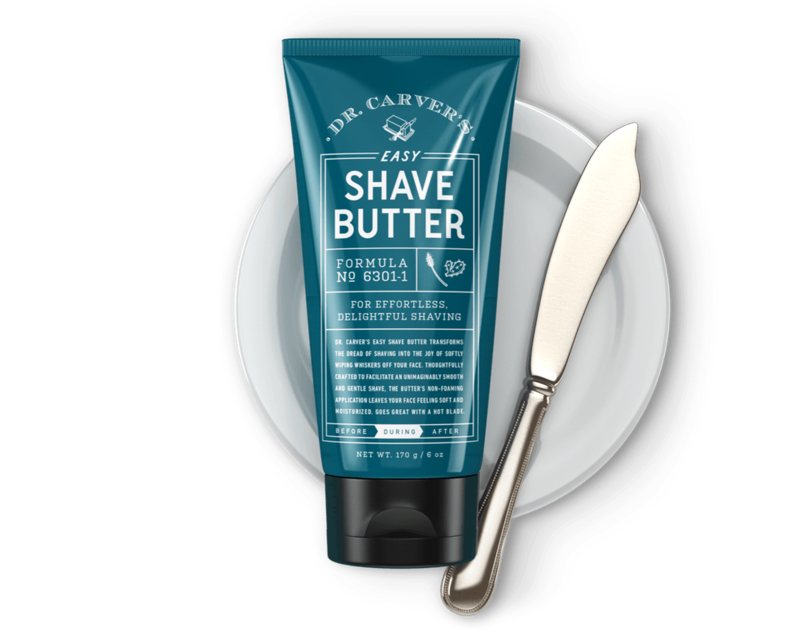 With Dr Carver’s shave butter, my skin was soft and smooth…. but it was soft and smooth with Van Der Hagen. The real test was…. would I get razor burn? Nope! No razor burn. I had finally found something that was easy to use, didn’t clog my razor, moisturized my skin, AND didn’t give me razor burn. Dr Carver’s Easy Shave Butter did the job. I would highly recommend Dr Carver’s shave butter. You can check it out here. Shaving cream kept drying out my skin and giving me razor burn, so I went on the search for a different product. A friend recommended shave butter, so I tried a couple of the leading brands. Dr Carver’s Easy Shave Butter was the clear winner because it didn’t dry out my face and it didn’t clog my razor. Well, there you have it. That’s my review of Dr Carver’s shave butter. I’ll never go back to shaving cream. P.S. 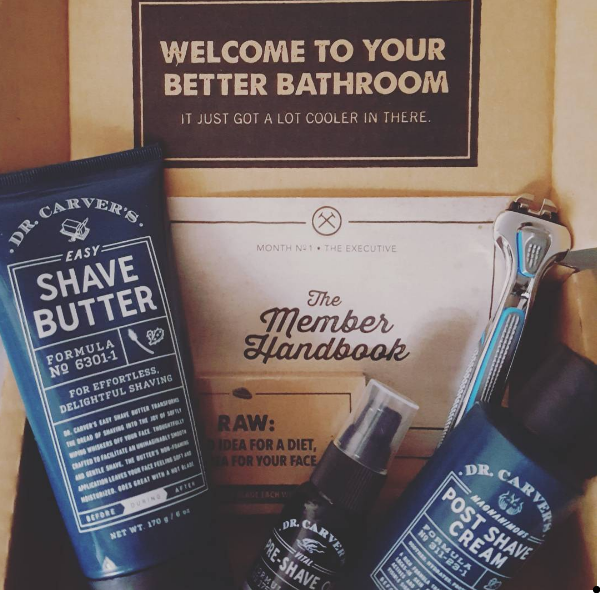 It seems as if Dollar Shave Club is heavily marketed to men, but as I read the reviews of Dr Carver’s shave butter, I saw that a lot of women were getting it as well. Some tried it after their husbands raved about it, and others got it specifically for their “sensitive areas”. I have to say, if you’re a woman who wants to use this, go ahead. It keeps your skin soft and doesn’t leave razor burn.